Scrambled eggs is one of my favourite styles of egg–light and fluffy, yet creamy and (usually) cheesy. It’s hard to resist a good scrambled egg. I have fairly recently gotten into enjoying mushrooms, so when I came across this recipe in one of our favourite cookbooks, I couldn’t resist. I’ve made it several times before, and the results are surprisingly delicious for being so relatively simple to make. Heat butter in a pan and add garlic, sauteeing for a few minutes. Add mushrooms and saute for 5-7 minutes until tender, adding in the parsley before finished. Remove mushrooms from pan and set aside. Pour eggs into same pan and stir frequently with a spatula. Season with salt and pepper and add in grated cheese. 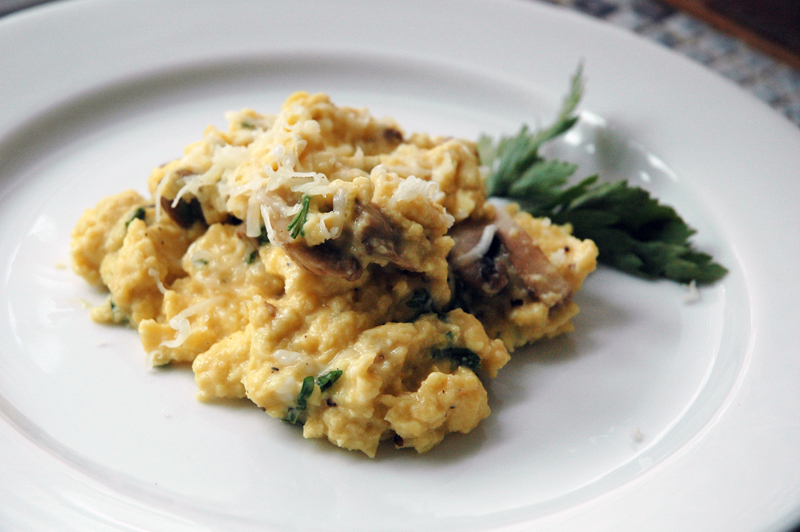 French-style scrambled eggs are usually served soft (which is how we like them), so just before you’re about to remove the eggs from the pan, stir in the parsley and mushrooms. You can also grate a little extra cheese on top. A few notes on preparation: The original recipe also includes chopped chives to be stirred in with the parsley, but we were lacking chives. It also doesn’t call for cheese, but, well…really, when am I not going to add a bit of cheese to my eggs. Lastly, the recipe originally calls for wild mushrooms. We do have dried ones, but I want to save those for something special, and regular mushrooms are perfectly tasty as well. I like regular scrambled eggs with cheese perfectly well, but there’s something about the addition of mushrooms that really kicks it up a notch. It really adds this great savoury, earthiness to the eggs, which, in turn, add their usual creamy tastiness to the mushrooms. It is a very lovely relationship. We really do prefer French-style scrambled eggs, where they’re still soft, because otherwise they run the risk of being too dry-tasting (at least for me).